Patel, K R and Sobczyńska-Malefora, A 2017. The adverse effects of an excessive folic acid intake. European Journal of Clinical Nutrition, Vol. 71, Issue. 2, p. 159. Wiens, Darrell and DeSoto, M. 2017. Is High Folic Acid Intake a Risk Factor for Autism?—A Review. Brain Sciences, Vol. 7, Issue. 12, p. 149. Chan, D. McGraw, S. Klein, K. Wallock, L.M. Konermann, C. Plass, C. Chan, P. Robaire, B. Jacob, R.A. Greenwood, C.M.T. and Trasler, J.M. 2017. Stability of the human sperm DNA methylome to folic acid fortification and short-term supplementation. Human Reproduction, Vol. 32, Issue. 2, p. 272. Verhoef, Hans Veenemans, Jacobien Mwangi, Martin N. and Prentice, Andrew M. 2017. Safety and benefits of interventions to increase folate status in malaria-endemic areas. British Journal of Haematology, Vol. 177, Issue. 6, p. 905. Johns, Paul W. Baxter, Jeffrey H. and Terp, Megan C. 2017. Verification of 5-Methyltetrahydrofolic Acid in Nutritional Products. Food Analytical Methods, Vol. 10, Issue. 10, p. 3255. Jennings, Barbara Anne and Willis, Gavin 2015. How folate metabolism affects colorectal cancer development and treatment; a story of heterogeneity and pleiotropy. Cancer Letters, Vol. 356, Issue. 2, p. 224. Sharma, Sunita and Litonjua, Augusto 2014. Asthma, allergy, and responses to methyl donor supplements and nutrients. Journal of Allergy and Clinical Immunology, Vol. 133, Issue. 5, p. 1246. Witthöft, Cornelia M. 2011. Fortified Foods with Vitamins. p. 21. Almeida, Lana Carneiro and Cardoso, Marly Augusto 2010. Recommendations for folate intake in women: implications for public health strategies. Cadernos de Saúde Pública, Vol. 26, Issue. 11, p. 2011. Bentley, Tanya GK Weinstein, Milton C Willett, Walter C and Kuntz, Karen M 2009. A cost-effectiveness analysis of folic acid fortification policy in the United States. Public Health Nutrition, Vol. 12, Issue. 04, p. 455. Menon, Shyam 2008. Folate Supplementation and the Risk of Colonic Polyps. Gastroenterology, Vol. 135, Issue. 1, p. 323. 1 Scientific Advisory Committee on Nutrition (2006) Folate and Disease Prevention. London: The Stationery Office. 2 Wright, AJ, Dainty, JR & Finglas, PM (2007) Folic acid metabolism in humans revisited: potential implications for proposed mandatory folic acid fortification in the UK. Brit J Nutr in press. 3 Winkels, EM, Brouwer, IA, Siebelink, E, Katan, MB & Verhoef, P (2007) Bioavailability of food folates is 80 % of that of folic acid. Am J ClinNutr 85, 465–473. 4 Rogers, LM, Pfeiffer, CM, Bailey, LB & Gregory, JF (1997) A dual stable-isotope protocol for determination of plasma folate bioavailability in humans: evaluation of urinary excretion and plasma folate kinetics of intravenous and oral doses of (13C5) and (2H2) folic acid. J Nutr 127, 2321–2327. 5 Wright, AJ, Finglas, PM, Dainty, JR, Wolfe, CA, Hart, DJ, Wright, DM & Gregory, JF (2005) Differential kinetic behaviour and distribution for pteroylglutamic acid and reduced folates: a revised hypothesis of primary site of PteGlu metabolism in humans. J Nutr 135, 619–623. 6 Whitehead, VM, Kamen, BA & Beaulieu, D (1987) Levels of dihydrofolate reductase in livers of birds, animals, primates and man. Cancer Drug Delivery 4, 185–189. 7 Choumenkovitch, SF, Selhub, J, Wilson, PW, Rader, JI, Rosenberg, IH & Jacques, PF (2002) Folic acid intake from fortification in United States exceeds predictions. J Nutr 132, 2792–2798. 8 Radimer, K, Bindwald, B, Hughes, J, Ervin, B, Swanson, C & Picciano, MF (2004) Dietary supplement use by US adults: data from the National Health and Nutrition Examination Survey, 1999-2000. Am J Epidemiol 160, 339–349. 9 Troen, AM, Mitchell, B, Sorensen, B, Wener, MH, Johnston, A, et al. (2006) Unmetabolised folic acid in plasma is associated with reduced natural killer cell cytotoxicity among postmenopausal women. J Nutr 136, 189–194. 10 Kelly, P, McPartlin, J, Goggins, M, Weir, DG & Scott, JM (1997) Unmetabolised folic acid in serum: acute studies in subjects consuming fortified food and supplements. Am J Clin Nutr 65, 1790–1795. 11 Sweeney, MR, McPartlin, J, Weir, J, Daly, S & Scott, J (2006) Post-prandial serum folic acid response to multiple doses of folic acid in fortified bread. Brit J Nutr 94, 1–8. 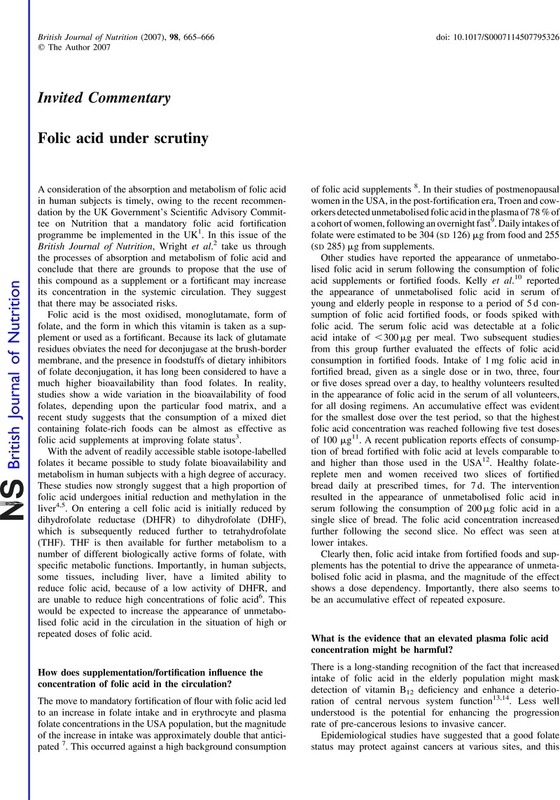 12 Sweeney, MR, McPartlin, J & Scott, J (2007) Folic acid fortification and public health: Report on threshold doses above which unmetabolised folic acid appears in serum. BMC Public Health 7, 41–47. 13 Reynolds, EH (2002) Benefits and risks of folic acid to the nervous system. J Neurol Neurosurg Psychiat 72, 567–571. 14 Morris, MS, Jacques, PF, Rosenberg, I & Selhub, J (2007) Folate and vitamin B12 status in relation to anaemia, macrocytosis, and cognitive impairment in older Americans in the age of folic acid fortification. Am J Clin Nutr 85, 193–200. 15 Song, J, Medline, A, Mason, JB, Gallinger, S & Kim, YI (2000) Effects of dietary folate on intestinal tumorigenesis in the ApcMin mouse. Cancer Res 60, 5434–5440. 16 Song, J, Sohn, KJ, Medline, A, Ash, C, Gallinger, S & Kim, YI (2000) Chemopreventive effects of dietary folate on intestinal polyps in Apc-/-Msh2-/- mice. Cancer Res 60, 3191–3199. 17 Van Guelpen, B, Hultdin, J, Johansson, I, Hallmans, G, Stenling, R, Riboli, E, Winkvist, A & Palmqvist, R (2006) Low folate levels may protect against colorectal cancer. Gut 55, 1461–1466. 18 De Vogel, S, van Engeland, M, Luchtenborg, M, et al. (2006) Dietary folate and APC mutations in sporadic colorectal cancer. J Nutr 136, 3015–3021. 19 Cole, BF, Baron, JA, Sandler, RS, et al. (2007) Folic acid for the prevention of colorectal adenomas: a randomised clinical trial. JAMA 297, 2351–2359.